There comes a time when every firm needs to explore the possibilities of doing more than just servicing its clients. To that end we have embarked on our first solo project, Shall We Coupon. 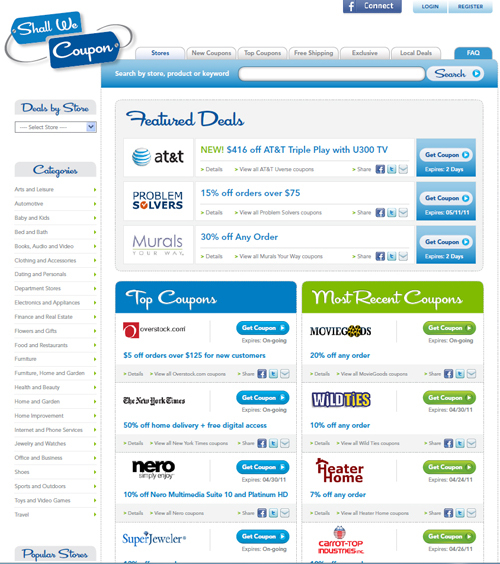 The sites started as a conversation and was created out of a desire to be able to answer our own questions about the couponing and discounting space but also in the hopes that it will help resolve the many challenges other have in locating free coupons that actually work the way they claim. The site was built in just under 6 weeks with the help and support of a number of our strategic partners. We feel it is an excellent display or our design, development, project management and execution skills and I am very proud of everyone that was involved in taking on this challenge in such a short period of time. I have high hopes in future for the success of the site as it moves through what we hope will be future iterations of development and becomes an even better and more useful consumer tool.